In a departure from tradition, the 2014 CMSNA AGM was held in the sometimes uncomfortable heat of early May in North Central Texas. Attendees from as far away as the East and West coasts rubbed elbows with clan members from as close as Arlington and Fort Worth for a great time. 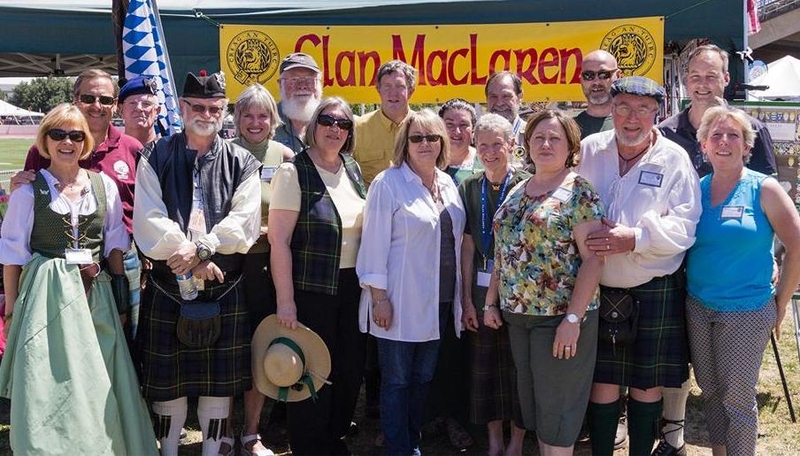 We enjoyed making and renewing friendships and also the professional highland games, numerous musical events and vendors.The picture above, from Denise MacLaurin, is a fair representation of those who attended the 2.5 day 27th annual Texas Scottish Festival. The meeting was hosted by Central South Commissioner Brian MacLaurin and Art Busbey and their better halves, namely Paula MacLaurin and Janet Busbey Nilsson. Brian had his 10x20 distinctive green tent set up with a smaller tent to the rear to accommodate the clan. As usual we had quite an assortment of books, posters, swords, crests and other paraphernalia for the edification and education of visitors. Brian and Art had a ready supply of single malts, beers, chilled water and snacks for their guests. The drinks helped alleviate temperatures as high as 95 degrees. Brian's reflective lined tent and mostly abundant breezes also kept things from getting too hot under the collar (or kilt). Luckily the breezes kept up and Brian did not have to run his generator and deploy the oscillating fans he had brought along. Friday evening, after a welcome BBQ attended by some CMSNA members, the TSF held a traditional calling of the clans. As one of two honored clans (Clan Morrison was the other), Clan MacLaren members led the parade of clans and President Chuck Lawson, accompanied by Fran at the speaker's dais, gave an able and short address formally opening the games. I am not sure, but somewhere between 40 and 50 clans were represented at the games and somewhere between 20 and 30 participated in the calling of the clans. Saturday the AGM dinner was held at the historic Cattlemen's Steak House in the heart of the Fort Worth Stock Yards district. The social hour started at 6 and the haggis was piped in shortly after 7. The piper was native Scotsman and TCU student, Lachlan Grassie, who did a wonderful job. Chuck Lawson did Robbie Burns proud with his traditional address to that great chieftain of the puddin' race and even the haggis had a tear in its eye (at least I think it was its eye - 'tis hard to tell wi' a haggis). The unfortunately lengthy Flowers of the Forest list was read with a moment of prayer and reflection. After dinner the usual business meeting was held along with news of the availability of the 4th printing of the History of Clan Labhran by Margaret MacLaren. Every member of the clan should have a copy of this wonderful history! In addition to those attending the AGM, we had a number of MacLarens or 'septs' show up at the tent who were not even aware of the AGM. Thanks to all for attending what turned out to be a great weekend.